I'm in my last week here in Germany, and very much looking forward to moving back to London to live and work, but unfortunately there are all sorts of things that need to be arranged before I move. That includes things like working out what I need to do with my bank account, pension, insurance, and other such things, all of which are really stretching my (much improved, though still very limited) knowledge of the German language. So that means that every now and then I need to resort to dictionaries (dict.leo.org is a great community-built one) or machine translation software such as that used by Google Translate to give me a better idea of the information that I'm trying to read. Trying Translate today on the Deutsche Rentenversicherung (German Pension Insurance) website, I noticed something that I hadn't noticed before. 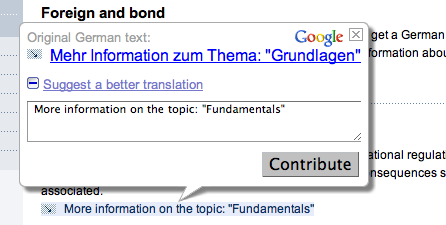 It may just be that I don't often translate whole web pages, but when trying that today I noticed that on each phrase you hover your mouse over, you get a little popup and the option to 'suggest a better translation', thereby giving a feedback loop to continuously improve the machine-translated text. There goes Google again, using individuals in the huge crowd that is their user base to actively improve their information services for all, and for free. They also announced this week that they will be allowing people to tweak address locations, improving their geocoding capabilities. It's not quite at the level of their efforts in India to let people generate map data for them, but it's starting to look like that's the direction it's moving in... and it's all with the aim of improving information availability around the world, so I'm all for it. Update: It looks like Google switched to their own in-house machine translation system last month, but has been letting people suggest new translations for some languages since earlier in the year.